A 28-acre parcel of land in Oceanside with approved plans for a 338-unit luxury apartment development sold for $25 mil. 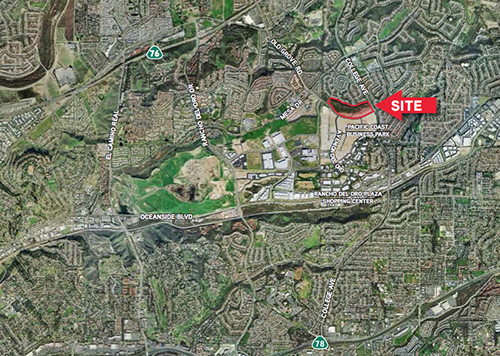 The property is located on the northwest corner of College Ave and Old Grove Rd within the Rancho Del Oro master-planned community. The planned development, called Terraza, will be comprised of a mix of one-bedroom/one-bath, two-bedroom/two-bath and three-bedroom/two-bath units with many high-end amenities. Gunder Creager, David Santistevan, and Ciara Layne-Trujillo of Colliers International represented the seller, RDO Village Investment LLC, and the buyer, Presidio Cornerstone Master LLC.